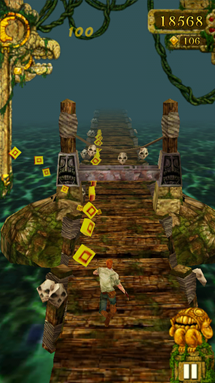 After countless bad copies, the official Temple Run game has finally hit the Google Play store! Like the iOS version, it's available for free and contains no adverts anywhere in the game. You can, however, make in-app purchases of coins to help you buy various items from the store as you progress. We'll cover that in a bit more detail later on, but for now, let's jump right in to the review! 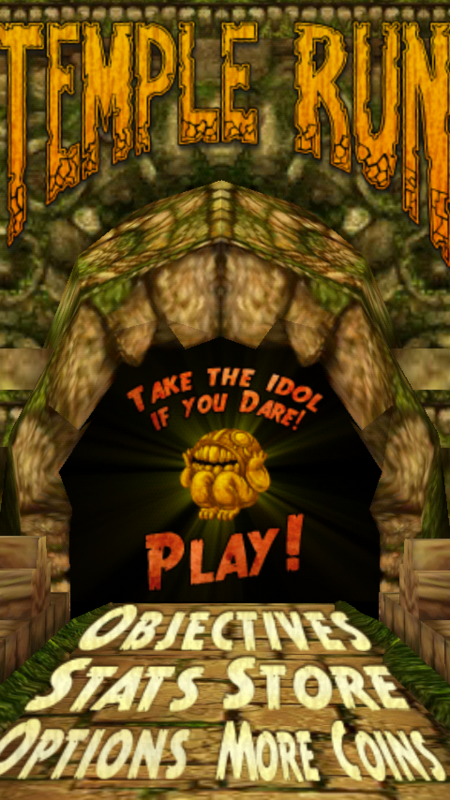 When you load Temple Run for the first time, you're thrown straight into a game with a few pointers that allow you to get to grips with the controls and the aims of the game. Put simply, you've stolen a cursed artifact from the temple, and you have to make your way through its walls whilst being chased by an angry hoard of evil demon monkeys (seriously) who want to eat you for dinner. Of course, the monkeys aren't all that you have to contend with as you play the game. In fact, if you're playing it remotely well then you probably won't see them too much as they'll be too far behind to cause you any hassle. 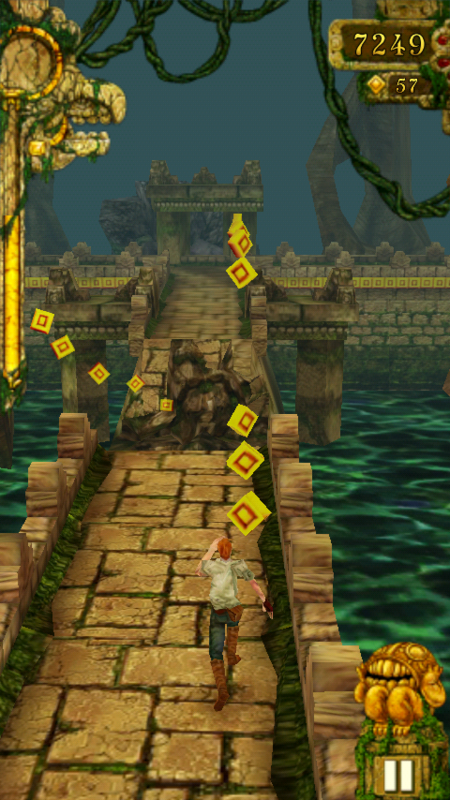 As you make your way around the temple, you can maneuver your character by tilting your phone left and right to collect coins which lie on the ground. These coins can be used to purchase items such as characters, power-ups, and utilities from the store. To mix things up and stop the game from becoming too repetitive, you will have to hop over tree trunks and slide under barriers that are blocking your way throughout the temple, and be ready to leap over gaps in the course too! 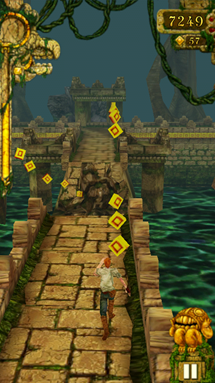 Some parts of the temple will have barriers at either side of where you're running to prevent you from having too much fun with the accelerometer and sending your poor character off to swim with the fishes, but as you progress further you will be running on thinner ground where it is much easier to fall off. The controls are very simple and easy to master; just think of your screen as a big D-pad with four basic controls. To move left and right, you simply swipe in the direction which you want to go. Jumping over tree trunks and other obstacles can be done with a swipe up, and finally you can swipe down to slide under some obstacles. So where does the game end? How do you complete it? 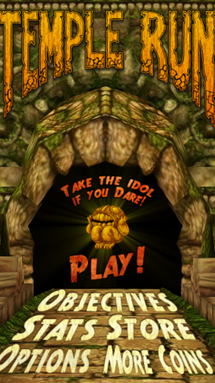 Essentially, Temple Run will go on for as long as you can run around the temple's walls, but like the iOS version there are 36 achievements which can be unlocked as you go through the game. These achievements range from running certain distances in a game to collecting a certain amount of coins and unlocking various items from the store. The in-game store is split into four different categories: power-ups, utilities, characters and wallpapers. 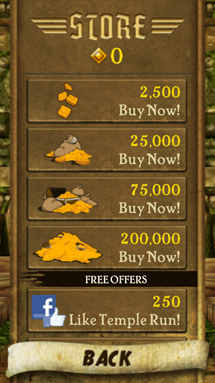 Different items within the store require a different amount of coins to purchase, ranging from just 250 to 25,000. 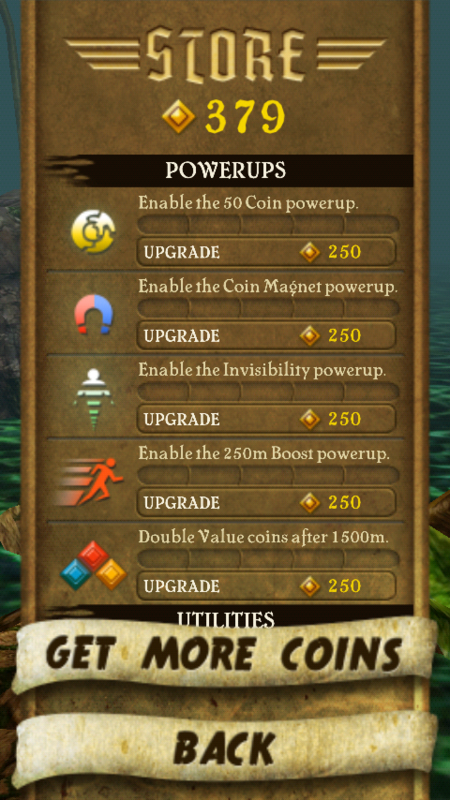 Purchasing power-ups will make it easier to score higher when you're playing Temple Run, as they place various items on the wall that you can jump in to whilst you're running. 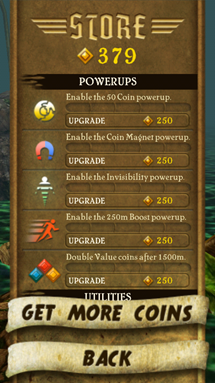 The utilities section includes items such as resurrection wings that will allow you to come back to life if you die whilst wearing them, and you can also buy boosts from here that allow you to start the game with 1000 or 2500 meters already covered. There are 7 characters to choose from in the store, and these cost either 10,000 or 25,000 coins. Wallpapers aren't available on the Android version of the game just yet, but these cost 5000 coins each on the iOS version so you can expect the pricing to carry over when they become available in a future update. If you don't want to collect the coins yourself or just happen to have some money lying in your bank account that you have to spend, you can buy more coins through an in-app purchase. The cost of the coins is the same as the iOS version, starting at $0.99 for 2500 coins and increasing to $19.99 for 200,000. 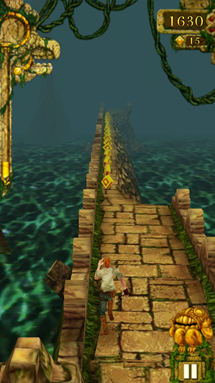 I've been testing Temple Run on a Sony Ericsson Xperia Neo running Android 2.3.4, and so far I've found the performance of the game to be great. In the past I've played the same game on the iPhone 4S, so I expected to see a performance drop when going to a mid-range Android device, but the developers have done a really great job of optimizing the game for different phones across the board. Considering that this is a 1.0 release of the game, there aren't that many bugs to complain about. 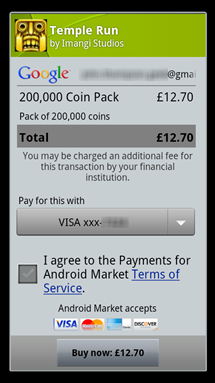 As the Xperia Neo has a slightly strange aspect ratio, with a resolution of 480 x 854, some of the content that should be displayed on the edges of the screen, such as the 'Store' and 'More Coins!' buttons appears to be slightly cut off. I assume that the developers have optimized the game for phones with a more conventional aspect ratio, but it's an issue that will hopefully be addressed for the Neo and phones with similar displays in a future update. 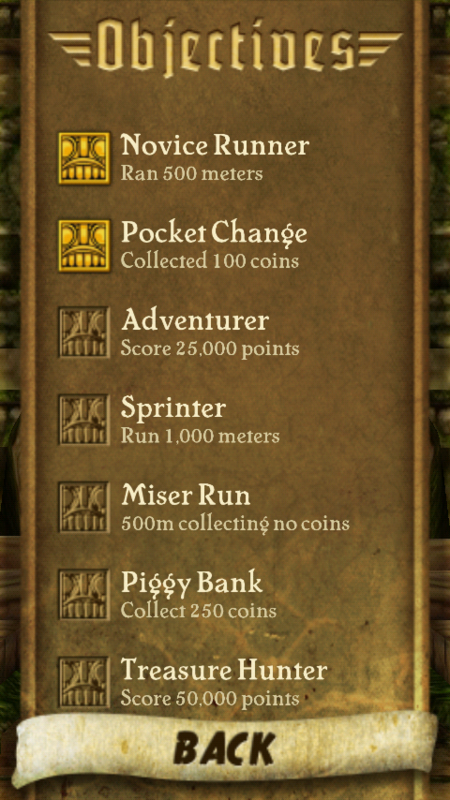 Minor issues aside, playing Temple Run has been plain sailing for me so far. The game looks great on Android, and it's really responsive to the touch screen; I've not witnessed any lag at all when controlling the in-game characters. 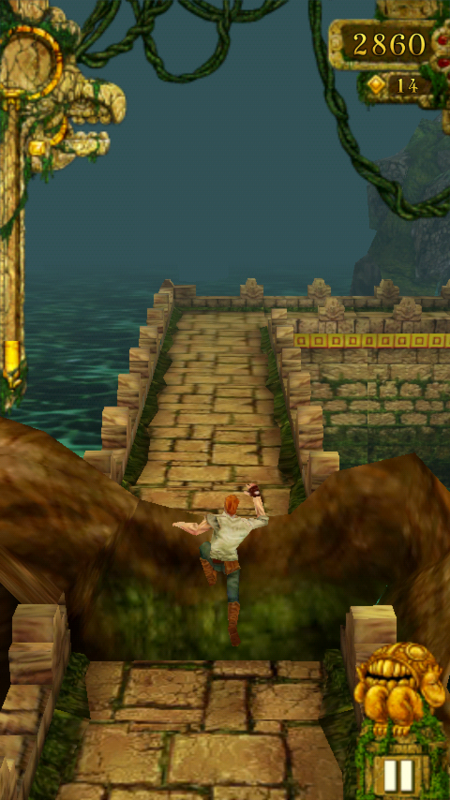 As Temple Run is available for free without any adverts stopping you from fully enjoying the game, I would definitely recommend it to anyone who's looking for a new casual game to play on the go. It's great fun and you don't have to spend money on coins if you don't want to, but be warned: it's highly addictive!